Bird Id - Forum - Identifying Birds - Is The Silhouette That Of A Sea Gull? Forum > Identifying Birds > Is The Silhouette That Of A Sea Gull? 1 sorry for the confusion, this is actually 1 bird in 8 separate photos from a video that have been stacked into 1 image, it some thing we do in astrophotography. 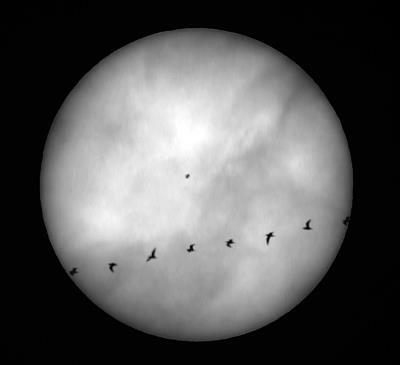 we quite often get videos of satellites like the iss going across the sun and moon as they can be predicted, but its very unusual to get a bird. as you say it does look like a gull. I thought it might have been a swift at first as there had been several flying around that day. so pleased to get something so different.